Anecdotally, we might hear that art and science are two sides of the same coin or left brain-right brain companions. 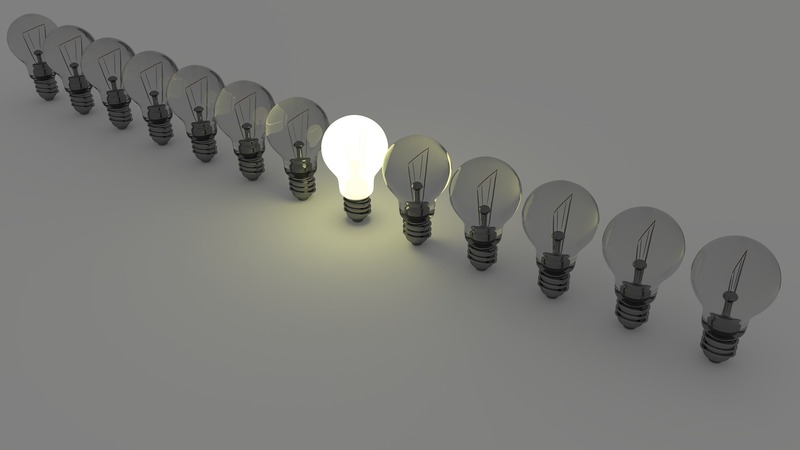 Internet searches give ample scholarship on the relationship between the two ideals – and debate whether they are or are not linked. 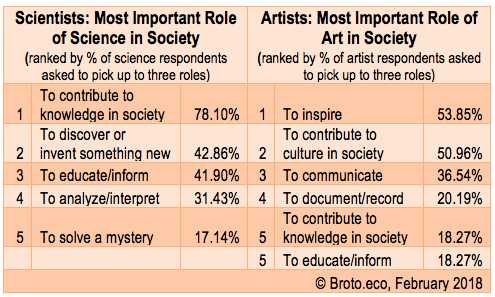 A new survey by Broto: Art, Science & Collaboration suggests that professional artists and scientists see their primary roles in society as distinctly different, but perhaps complementary. Broto, a new organization dedicated to art and science collaborations, distributed cloned, online surveys in February 2018 to 100 professional artists and, separately, 100 professional scientists in the US and Canada. The goal of Broto’s independent market research is to assess degrees of agreement between the two populations as foundation work to understand art and science collaboration – the cornerstone of the Broto mission. Contributing Culture/Contributing Knowledge: More than 50% of professional artists polled say their contributions to culture comprise their most important role in society while 78% of professional scientists say their contributions to knowledge comprise the most important role of science. Inspiring/Analyzing: Art’s focus on its role “to inspire” might pair with science’s preferred role “to analyze” – both of which top the independent surveys. Discovering/Documenting: Scientists want “to solve a mystery” and “to discover/invent something new” – top picks for science roles in society – and artists want to “to communicate” and “to document” – top picks for art roles in society. As another way to explore the similar priorities between the professions of art and science, the role “to educate/inform” society ranks high on both lists – with scientists ranking it third in important roles and artists ranking it tied for fifth. Clearly, despite distinct roles, both professions value outreach as a key, shared objective. The survey also asked professional artists and scientists for their picks for the least important role for their fields in society – another chance to confirm the non-priorities. 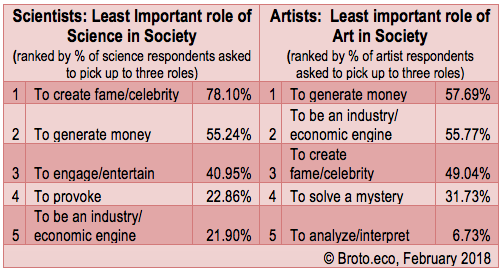 Echoing other survey results from this Broto research, artists and scientists again agree that neither art nor science see a role in making riches, fame or creating economic engines. Asked to pick the least important roles of art and science in society and terms like “to generate money” or “to create fame” and “to be an industry” topped the lists of least important. As an extension of the theory that art and science are different, artists pick roles of solving mysteries and analysis as low priorities for art, while scientists have little interest in engaging/entertaining or provoking. Are these low priority roles better cast as tasks and objectives that artists and scientists might delegate to a collaborating partner, for whom those roles are higher priorities?